When a big website goes down it doesn’t take long before Twitter is full of tweets lamenting that it’s down. 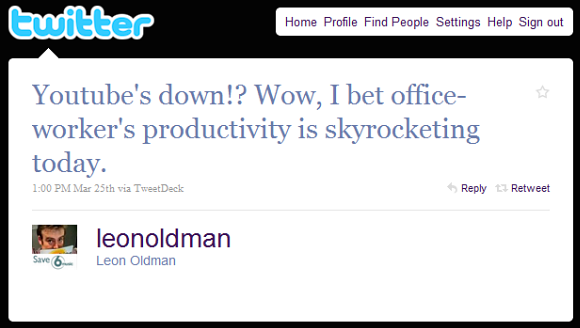 This behavior is so common that even Twitter itself has “is down” as one of its query tips on the Twitter Search page. Now that Google has added a Twitter timeline graph to its search engine, we can actually visualize how much people complain on Twitter when big sites go down. We can now see how the amount “down tweets” blow up. Finally we have some history to go with real-time search, so we should be grateful that Google got access to Twitter’s firehose. Let’s take a recent high-profile example that happened last month; YouTube’s outage on March 25. Here’s a historical view of tweets containing “YouTube” and “down”. The top graph shows all of March, the bottom is zoomed in on March 25. Above: Google’s tweet history graph(s). We added the red for emphasis. 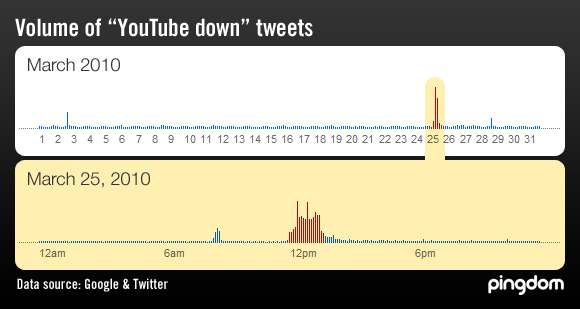 Note that you can even see that YouTube had a smaller hiccup a few hours before the big outage. You can find similar patterns for other high-profile outages, such as for example Wikipedia’s outage on March 24. The bigger the site, the bigger the noise will be as millions of users fail to access it. If a small site or service suffers from an outage, not many people will be affected, and the noise they can or will make is limited. When something like YouTube or Gmail goes down, though… Oh boy. Now that everyone is a publisher, word of mouth has simply exploded. It’s given consumers a voice they have never had before, ever. And via retweets, those tweets can spread like wildfire and create a “Twitter Effect” (scroll down a bit in that post to see how tweets spread, what we call the Twitter Effect formula). And that’s just Twitter. You can bet there will be a good amount of chatter on Facebook as well, and other social media channels where publishing your opinion is quick and easy. Why hasn’t Twitter made its own Google Trends? We would love to see Twitter implement a way to dive into the history of its own tweet archive. It could either be part of Twitter Search, or have its own page. Perhaps Twitter could create a “Twitter Trends” tool just like Google Trends, where users can dig into trends and tweet statistics. It would give Twitter another powerful way to leverage all that valuable real-time data. have to agree with Jonas..